In Uganda, Golden monkey Trekking is done in Mgahinga Gorilla Park which is located south west of Uganda. In Rwanda, the trekking is done in Volcanoes National park. However, in Uganda you can do Golden monkey Habituation where you spend 4 hours with the beautiful primates. Uganda and Rwanda are known for Primate adventures. The most common tours are the Gorilla trekking and Chimpanzee tracking. However, there is a new species of primates that is far more beautiful than these giants. This is the GOLDEN MONKEY. Golden Monkeys (Cercopithecus Mitis Kandti) are endemic (can not be found anywhere else) to the Virunga Conservation area. This Area covers Uganda, Rwanda and DR Congo. Golden monkeys get their name from the Golden-Orange and black-silver Fur(coat). This makes them the most beautiful primate species. Golden monkeys are small monkeys, very Athletic and move at a high speed, they spend most of their day playing in the bamboo trees in the forests, however they can also be found on the ground playing about. These beautiful primates are social animals and they live in big numbers in a collection of nuclear families with a Dominant male and several females. These monkeys are small in size and are not shy compared to other primates (Gorillas and Chimpanzee) and on the trek you can come so close to them.
" The golden monkey has a diet that consists primarily of young bamboo leaves, fruits, bamboo branch-lets, bamboo shoots, invertebrates, flowers, and shrubs. However, the golden monkey is an opportunistic feeder and diet can easily be influenced by the availability of fruit. During seasons where ripe fruit is available, the golden monkey tends to feed more on fruit. The golden monkey may also feed on various flowers and shrubs when they are available. The most frequent invertebrate eaten is the pupae of lepidopterous larvae picked from leaves. Bamboo tends to be the most frequently eaten because it is often more available year round. " Golden monkey tracking is an act of moving through the forest looking and searching for the primates. Trekking for golden monkeys can be strenuous but not as much as for Gorillas and Chimps. Tracking Golden monkeys is done with the help of a Ranger Guide who is experienced in tracking and locating the monkeys. Tracking is done following the trails left behind the monkeys as they move from place to place in the forest looking for food. During the trek, you can also have a chance to see other primates, forest animals and several bird species. On finding the monkeys, you spend time with them. 1hr for trekking and 4hrs for Habituation experience. Golden Monkey trekking in Uganda is done in Mgahinga Gorilla national park. The park is located in the south west of Uganda. Mgahinga is part of the virunga conservation area and this park is blessed with primates. The most famous are Golden Monkeys and Mountain Gorillas. Here you can do Golden monkey trekking and also Gorilla trekking. You can take advantage of this unique opportunity and see the primates on the same safari itinerary. On the trekking day, you arrive at the park offices at 7:30am and register. This process ensures that you are signed to a trekking group and then you are escorted by a park ranger into the forest for start on the trek for Golden Monkeys. The trail starts at exactly 8:00am. Trekking for these primates is not hard as compared to their cousins the Gorillas. This is because these monkeys are not found high in the mountains but rather in the bamboo trees which are located on the lower slopes of the mountains. On finding the monkeys, you will spend 1hr and you can take photos. Enjoy your time with the golden monkeys and then return back to the Lodge for another activity the following day most preferably Gorilla trekking, Nature walks, Batwa experience etc. Golden Monkey habituation is done in Mgahinga Gorilla National Park. The habituation takes a duration of about 4hrs compared to trekking which is only 1hr. Upon tracking the primates, you enjoy an exclusive experience with the Golden monkeys as they do their daily activities. Price of Golden Monkey trekking Permit Uganda is $50 for 1hr. Check out our habituation Safari for an inquiry. 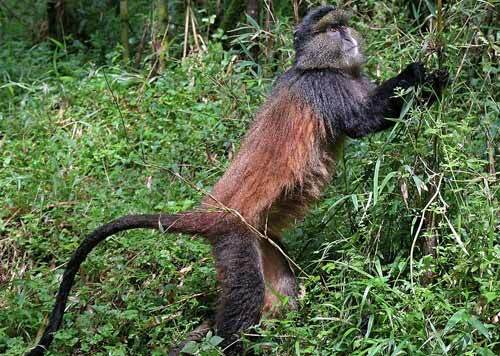 Apart from Uganda, Golden monkeys can also be trekked in Rwanda in Volcanoes National Park. 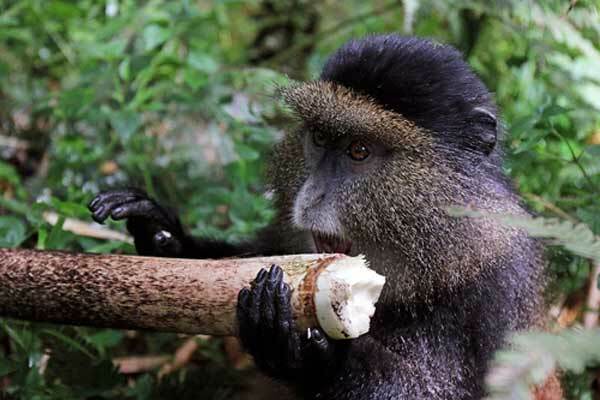 Just as Mgahinga National park, Volcanoes National Park is also a primate sanctuary. Here there are (2) golden monkey groups which can be visited in Rwanda. These are located at Mt Sabyinyo with the bigger group having about 90 individuals. Currently In Rwanda, Habituation is not done but this safari can be done in combination with Gorilla trekking and Habituation. The trek is not as hard as it is for Gorillas, however below is what you need to enjoy the trekking experience.